NEW YORK - Noting that a little more than a year has elapsed since the re-establishment of diplomatic relations between Cuba and the United States, and while “some progress” has been achieved in bilateral relations, the decades-old economic embargo against Cube is still in force, and “there is still a long way ahead in order to move towards the normalization of relations,” Cuba’s foreign minister told the United Nations General Assembly on Thursday. Bruno Rodríguez Parrilla particularly noted progress in diplomatic relations, dialogue and cooperation in areas of mutual interest, as evidenced by the high-level visits that have taken place, including by US President Barack Obama. Moreover, the recent examples of the economic and financial damages caused by the embargo to Cuba and third 2countries are numerous. 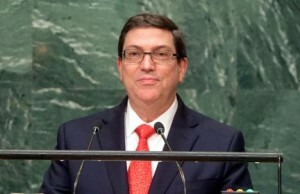 “As long as this continues to happen, we will continue to present to this Assembly the draft resolution entitled ‘Necessity of ending the economic, commercial and financial embargo imposed by the United States of America against Cuba,’” he said, reiterating the Cuban government's willingness to continue developing a respectful dialogue with the US government, knowing that there is still a long way ahead in order to move towards the normalization of relations. “[This] means building a new model of bilateral relations in our common history, which could never be forgotten. For this to be possible someday, it will be indispensable that the blockade is lifted. The territory illegally occupied by the US naval base in Guantanamo against Cuba's will, must be returned to our country,” he stressed. Indeed, Rodríguez Parrilla said the huge nuclear and conventional stockpiles and the annual military budget of $1.7 trillion give lie to those who affirm that there are no resources to eradicate poverty and underdevelopment. “However, there are many arguments that justify the urgency of building a new international financial architecture,” he stressed. Against such a backdrop, he said the UN must be defended from unilateralism, and at the same time it needs to be reformed into a more democratic organization that is closer to the problems, needs and aspirations of peoples; capable of leading the international system towards peace, sustainable development and the respect of all human rights for all. With than in mind, he called for, among others, reform of the Security Council, both in terms of its composition and working methods – “a task that should not be put off any longer.” The strengthening of the General Assembly and the restoration of the functions that were usurped by the Council should guide the search for a more democratic and efficient Organization.